You’d think by this point, I’d be sick of cupcakes. It’s certainly been a bit of cupcake overload here this week, what with Cupcake Camp last Sunday, and then spending the rest of the week recovering from it. However, I managed to find a bit of gas left in the tank to crank out three more dozens of cupcakes for my classmates yesterday. Thursdays are long days for us, and I thought we’d probably be in need of a sugar-boost by mid-afternoon. I had some leftover frosting and caramel sauce from Cupcake Camp that I had thrown into the freezer, so I knew that one dozen of the cupcakes would be the Chocolate Cinnamon Cupcakes with Caramel Cream Cheese Frosting. The second dozen I made with my friend Jenna in mind. A few of us went for brunch at 7 West earlier this week, and while we were waiting for our meals to arrive, the waiter came out with this massive cake and displayed it on the counter. What was it? Banana chocolate. Which then resulted in the two of us fantasizing about chocolate banana cake for the next couple of minutes. After seeing that cake, I couldn’t get the image out of mind, and I knew the only way I could was to bake the cake myself. Out came my trusted banana muffin recipe (from the Williams-Sonoma collection), in which I replaced the walnuts with chocolate chips, and frosted them with a rich chocolate fudge icing. My last dozen was a spur-of-the-moment decision. I had originally wanted to make coconut cupcakes, but was distraught when I discovered my local Sobey’s had a very, very pathetic selection of extracts available in their equally pathetic baking section (granted, I can’t really complain since it is a small store…). It was close to being a blizzard out there, and I was already went and cold so I made the executive decision to go home and simply whip up something with whatever I had in my fridge. I had Maltesers, and I had half a carton of whipped cream. Thus I baked Chocolate Malt Cupcakes with Chocolate Malt Whipped Cream. The chocolate malt cupcakes were incredibly rich and dense, having a brownie-like crumb that melted in your mouth, which paired nicely with the light whipped cream on top. (It’s is so delicious on its own! 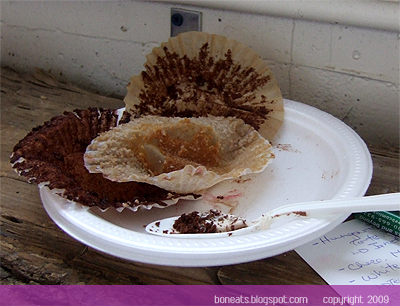 I’m definitely guilty of having eaten half a bowl of the leftover cream.) 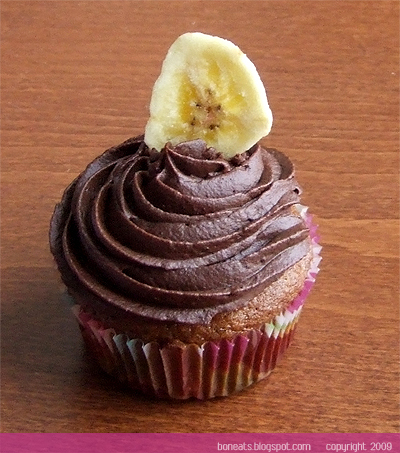 The banana chocolate cupcakes were pretty incredible though. It really does make a Cinderella story out of my simple and plain banana muffins. 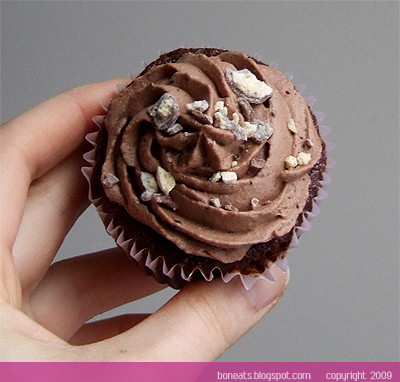 Topped with the fudge frosting and packed with chocolate chips, it’s in a whole different class. 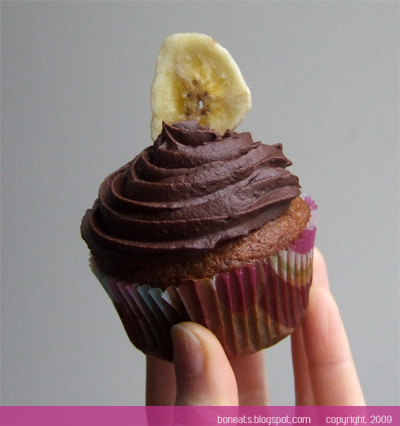 And we all know how chocolate and banana make a great pair together, and this fudge frosting is an absolute killer with the banana muffin. 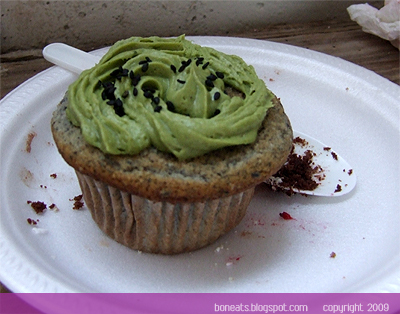 Have we all recovered from the sugar-high madness that was Cupcake Camp 1.0 this past Sunday? I know I’m still a bit hungover from all the sugar consumed in the span of three hours that day, but it was certainly worth it. There were many beautifully decorated and delicious tasting cupcakes at the event. Once again, a huge thank you to Monica and Michelle for organizing the first ever Cupcake Camp in Toronto, as well as to my fellow bakers out there who shared their wonderful creations. I’m definitely looking forward to the next camp! 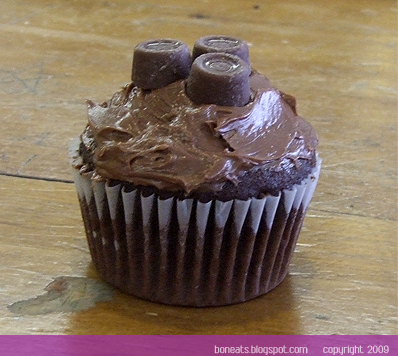 As promised, I bring you a more detailed post about the cupcakes I made for Cupcake Camp. When my friend Suzie first informed me about Cupcake Camp, I immediately started digging through my collection of recipe books and magazines and googling online for inspiration. 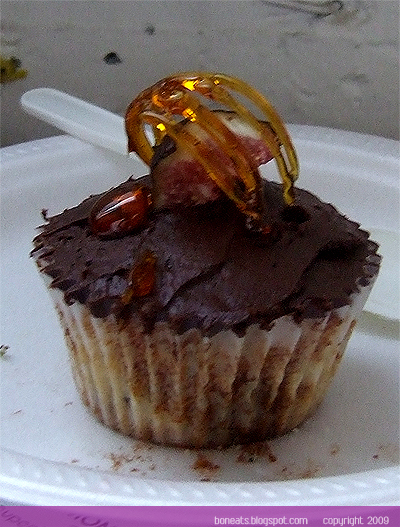 I dabbled with a few ideas here there, some using fruit, others being tea-infused, but deep-down, I think my heart was already set on making some form of a chocolate cupcake. Originally, I planned to make a chocolate chestnut cupcake that would also make use of some liqueur in one form or another, but I had a hard time finding chestnut purée. My busy schedule since returning back the city after the holidays and beginning the second term of school, not to mention a lack of a car, afford me very little time to run away the city just for a can of chestnut puree. Thus, on to plan B. I remembered this fabulous cake a fellow classmate made a while back for a presentation: vegan chocolate cinnamon. I absolutely fell in love with that cake; it was incredibly moist and the warmth of the cinnamon matched so well with the richness of the chocolate. Inspired by the cake, I decided to make Chocolate Cinnamon Cupcakes. I used my stand-by chocolate cupcake recipe, and simply threw in two heaping tablespoons of cinnamon. I also toyed with the idea of caramel while I was planning out my cupcake, and as a happy medium, I decided to incorporate the caramel into my frosting. 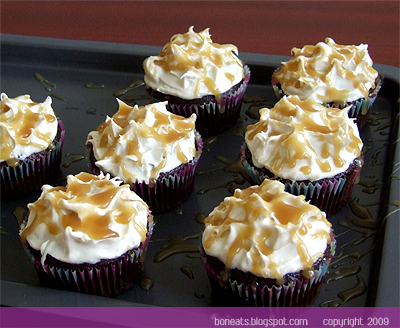 I found a wonderful recipe for Caramel Cream Cheese Frosting on Ivonne’s blog, and I must say, this frosting is divine. Creamy, buttery and sweet, with the slight tang of cream cheese, it was the perfect match for the chocolate cinnamon cupcakes. My favourite was the caramel sauce, which tastes even better when you add a good pinch of salt for an instant salted caramel sauce. 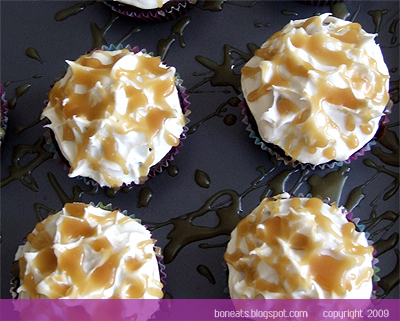 These cupcakes smell heavenly yet sinful at the same time; open a box of them and you’ll get a whiff of the sweet, buttery caramel with the spiciness of the cinnamon. I dare you to resist having one! 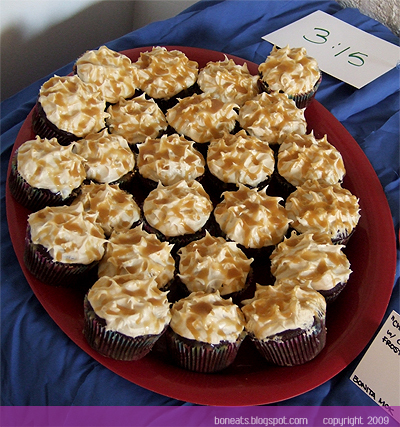 Funnily enough, the editor in me has just realised how alliteration-centric these cupcakes are. 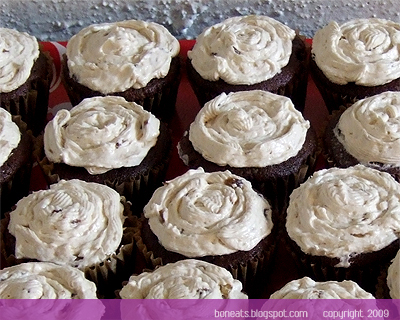 Chocolate Cinnamon Cupcakes with Caramel Cream Cheese Frosting. Now say that five times fast. And on one final note regarding Cupcake Camp, I was finally able to try Suzie’s Chocolate Rolo Cupcakes today, which got great reviews from tasters on Sunday. A rich, chocolate cupcake (using the Magnolia recipe) with an incredibly creamy frosting (it’s my favourite part of the whole cupcake! 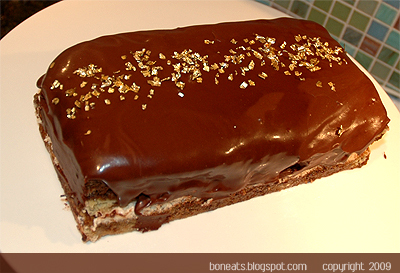 ), Suzie filled the centre with gooey caramel, replicating its namesake confectionary. 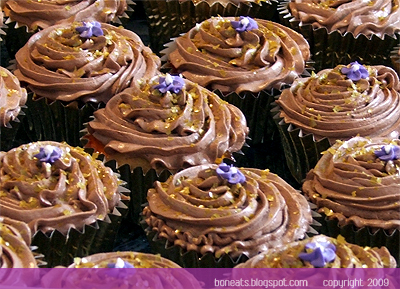 These cupcakes are perfect for any chocoholic! Happy Chinese New Year to all! It’s the biggest and most important holiday on the Chinese calendar—a time to reflect on the past year, and to look forward to a new year that will be filled with joy, peace, prosperity, good health, happiness, and most importantly, more good eats! My parents are coming down for a visit at the end of the week, and my mother already has a list of food she’ll bring for me! So for the next two weeks (since that’s how long the New Year festivities last), I’ll be taking a bit of a hiatus from my post-holiday diet to stuff my face to my little heart’s content with turnip and taro cakes, various fried pastries and many other delicious and traditional Chinese dishes. I’ll admit, my talent for cooking Chinese food is sorely lacking, as I’ve stated before. I’ve fully taken advantage of my mother’s own brilliance in the kitchen, and while I can make a mean chocolate cake or lasagna, or even a fancy three-course dinner, I often find it a challenge to cook Chinese food well. Perhaps a lot of it has to do with my mom being such a good cook, and knowing that I could never excel in that culinary area as well as she can. But a quick phone call home to mom and some independent research online managed to temporarily curb my defect. 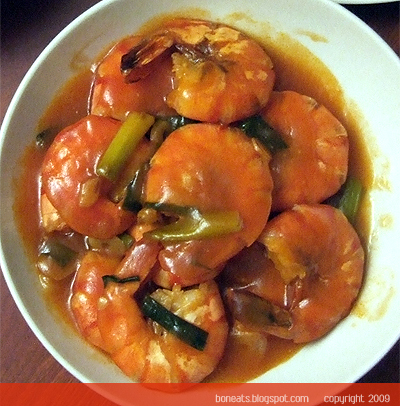 Sweet and sour is pretty synonymous to Chinese food in the Western world, thanks to the popularity of sweet and sour pork and sweet and sour sauce. I’m a huge fan of sweet and sour myself; I love the combination of the sharp zing of the vinegar and the sweetness of the ketchup and sugar coating crispy pieces of fried meat. I made some Sweet and Sour Shrimp, pan-searing the shrimp instead of frying them before tossing them in a sweet and sour sauce made of sugar, ketchup and vinegar. 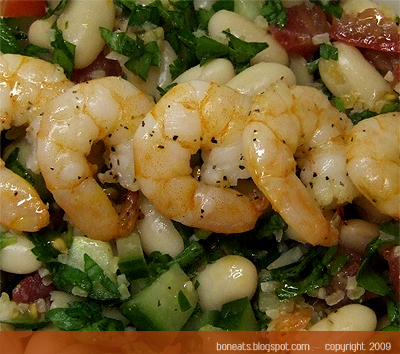 The shrimp will taste extra delicious if you fry them (as will anything really, because who doesn’t secretly love fried food?! ), but they work just as well pan-fried as I have done. 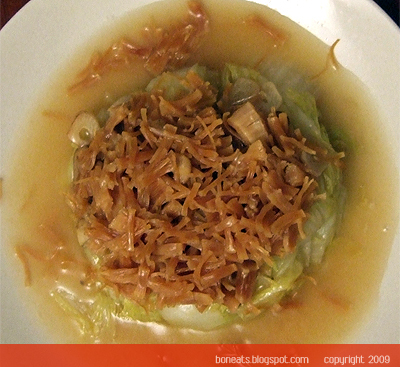 I also made Braised Napa Cabbage with Conpoy. Fresh scallops are delicate in flavour, but conpoy (dried scallops) have a much deeper and pungent flavour to them. It makes an impact in dishes, and is balanced really nicely here with the sweetness of napa. There was also some fried garlic layered between the conpoy and napa, which gave the dish that little extra “oomph” on the flavour radar. North American has seen its fair share of fad diets in the past decade, and it wasn’t until recently that people have begun to once again embrace such indulgently rich foods like duck, foie gras and pork belly more openly. My mom makes an incredible braised pork belly dish every year for the new year festivities, made with dried preserved vegetables. It’s incredibly time consuming with the amount of work that goes into making it, but it’s absolutely worth it when you taste a bite of the tender, melt-in-your-mouth morsels of meat. I myself don’t have the patience or the desire to make such a dish for myself, so I made a simple Braised Pork Belly with Soy and Star Anise (very similar to red-braised pork). 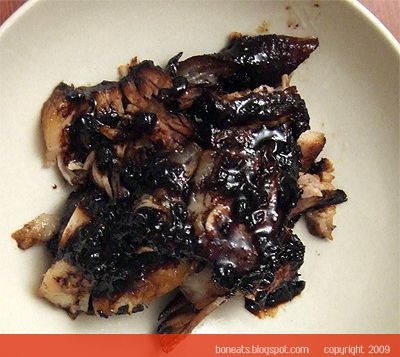 Red-Braised Pork Belly is a popular, homestyle dish that hails from the Hunan region. Braised in a mixture of dark soy sauce, sugar, star anise, ginger, garlic and cinnamon, the pork belly packs a lot of punch in depth and complexity of flavours. Most people like to enjoy eating the fatty pieces of pork with steamed buns, to help cut through the richness of the meat. I decided to skip the bun and wrapped them in some lettuce leaves along with a slice of cucumber. The Year of the Ox seems to be starting off on the right note for me, and I can only hope that everyone else enjoys another year of delectable culinary delights! Here’s to a Happy New Year, and to many more days of happy cooking! There’s this lovely little café on the Danforth that I love to frequent for lunch. Mocha Mocha Café is a small establishment with only a handful of tables squished together that specializes in homestyle, comfort foods, serving a variety of salads, sandwiches and daily specials for a quick bite to eat. I’ve only ever had their salads when I’ve eaten here, but they have been some of the best salads I’ve ever had. They are always fresh, and the combination of ingredients makes for a hearty, comforting and satisfying meal (something that not all salads can achieve!). What really makes Mocha Mocha’s salads so special (in my opinion), besides the fact that they’re always very fresh, is the addition of warm potatoes. 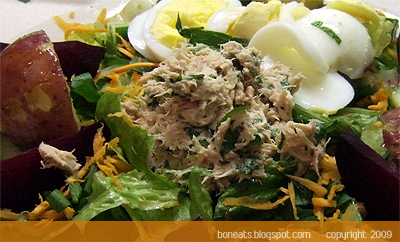 Most people often pick salads because it’s healthy and because there are no carbs. Trust me, I’ve been one of those people who have sometimes picked to eat a salad over a club sandwich for those reasons. But the potatoes give you enough carbs to satisfy your hunger and give you energy for the rest of the afternoon. Plus the combination of the warm potatoes against the cool crispness of the lettuce is so comforting. I had lunch at Mocha Mocha this past week with a friend, who tried their Mediterranean salad for the first time and loved it. Alas, we ended up dreaming of salads with warm potatoes for the rest of the week. 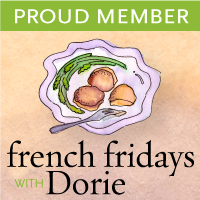 This sparked me to replicate Mocha Mocha’s Salad Niçoise for dinner the other day. 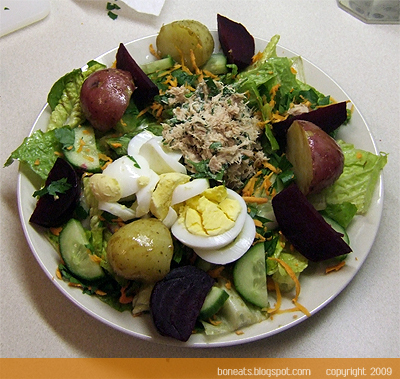 I simply tossed some torn romaine lettuce with some balsamic vinaigrette, and topped it with chopped parsley, grated carrots, cucumber slices, roasted beets, hard-boiled egg, boiled potatoes and tuna salad (I mixed a can of drained tuna with 1 tablespoon of mayo and a handful of chopped parsley). It was so delicious and satisfying, and if you’re a salad hater, it’ll really change the way you think about salads! Got the lunchbox blues? Sometimes I feel like I do. I'm the kind of person who always packs a lunch. Firstly, it much healthier and you actually know what you'll be ingesting, and secondly, it's a much cheaper option and when you're still a student like myself, you try to save every penny that you can. That being said, sometimes I get into a rut when coming up with fresh and exciting lunch ideas. Half the time I'm too busy to prep a fantastic lunch, and other times I'm just too plain lazy. But with my post-holiday diet going on, in which I've sworn off cheese (amongst many other things...like sugar...and coffee!! ), that means I also have to give up my usual of cheese and crackers. I used to always love bringing salads for lunch as well, but I always found it a bit time consuming with the chopping, and the fact that it took up more room in my bag. However, after a little hiatus, it was about time to get back into salads. 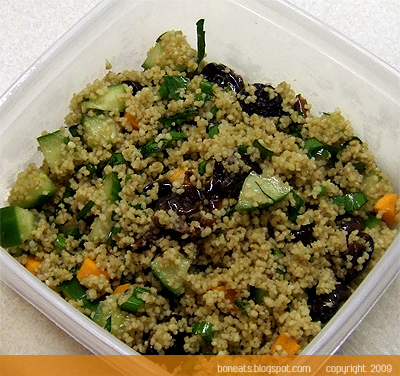 I luckily dug up some couscous in the back of my cupboards yesterday, perfect for a couscous salad! I simply tossed the couscous with some soaked dried cherries, diced carrots and cucumbers, some finely chopped Italian parsley and green onions, and a balsamic vinaigrette. 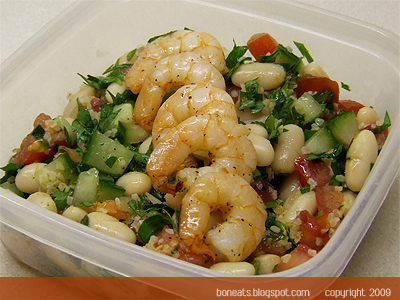 It was fast, easy, healthy and delicious! The best thing about couscous is that it can take about any kind of ingredients: add marinated and/or roasted vegetables and some feta for a Mediterranean couscous salad, or soak the couscous in orange juice and throw in other dried fruits like apricots and raisins for a sweet variety. The combinations are endless, and it’ll make lunch less bland when you have the opportunity to mix things up. Much belated, but happy new year to everyone nonetheless! I hope everyone had a fantastic holiday, filled with lots of yummy treats! I know it’s been a while since I’ve updated, and I apologize for that. This year’s holiday baking marathon really took a lot out of me. Baking for two week straight, and producing over 500 cookies made me suffer from a serious case of baking burnout by the end of it that I could barely muster up the energy to get into the kitchen much after that. Add in the fact that my sleeping schedule was absolutely atrocious, I figured that this rather sleep-deprived cook was safer out of the kitchen than in it. I did treat the family to a New Year’s Eve meal of veal shanks and risotto, since my brother never got a chance to try the osso bucco I made over a year ago. I thought it would be fun to start off the year with a bit of flare, and after flipping through numerous books, I settled on making an Opéra cake. If anyone has seen an Opera cake, it looks extraordinarily elegant, with its multi-layers of almond sponge, coffee buttercream and chocolate ganache. Its elegance makes it the star of any show, hence its name, as it was inspired by the grand elegance and theatricality of the opera. There are five key elements that make up an Opera cake: the almond sponge, the syrup that is used to soak the sponge, the coffee buttercream, the chocolate ganache, and the chocolate glaze. While it does seem daunting to even attempt this cake after reading the recipe and seeing how beautiful they look in professional French bakeries, it’s actually less complicated than it sounds. Granted, there are a lot of steps, since they are a lot of layers to the cake, but once you’ve prepared everything, assembling the cake doesn’t actually take a lot of time. I used the recipe from Le Cordon Bleu, and it was fantastic. The almond sponge was incredibly light and moist. The only real complaint I had was that my buttercream curdled a bit, which didn’t give me a fluffy, smooth texture I was looking for, and I found the glaze to be a bit too much on the runny side, despite having already reduced some of the cream it asked for. For my first attempt though, I don’t think it turned out terribly bad, and like any French dessert, it was just the right sweetness. 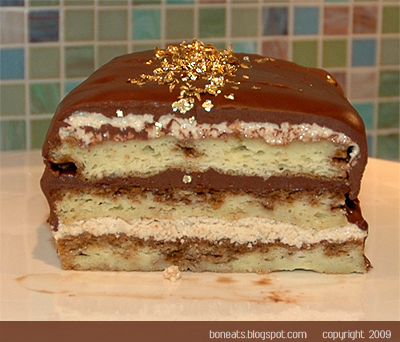 Be sure to serve your guests small slices of the cake though, because it is quite rich and heavy. And on a fun note, I bought some gold flakes before the holidays and finally found an occasion to whip them out and sprinkle them over the cake. What better way to usher in the new year with a bit of flair and good fortune, right?